We bring forth for our clients an extensive range of Clock Anti Clock Standing Machines, which is simple to operate and high in demand due to robust construction and excellent durability. These Clock Standing Machine are designed with circular cage that have a number of cradles, required to hold the spools. Our clients can avail these Clock Anti Clock Standing Machines machines at most nominal rates. We offer Anti Clock Standing Machine that is suitable for the production of the multi-strands conductor for different sizes of cables. The machine is offered in various models depending on the number and size of spool. The machine is designed with a circular cage having a number of cradles that is required for holding the spools. The cage moves in both the clockwise and anti-clockwise direction along with the gearbox. The lever that is offered with the gearbox helps in changing the direction of the clockwise and anti-clockwise movement. The machine that we offer has a dye holder head that keeps the shape and sequence correctly. It also has a shaping head to shape in either half round (D shape) or triangular (D shape). 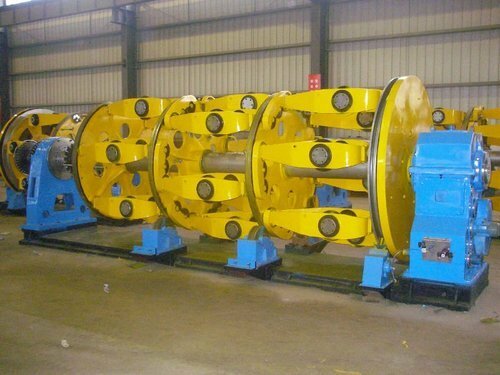 The machine has MS capstan wheel for pulling the twisted and shaped conductor. Ease of operation and minimum maintenance are some of the valuable features of the machine. Looking for “Clock Standing Machine”?